Indulge her with romance and signature Hot Diamonds sparkle. 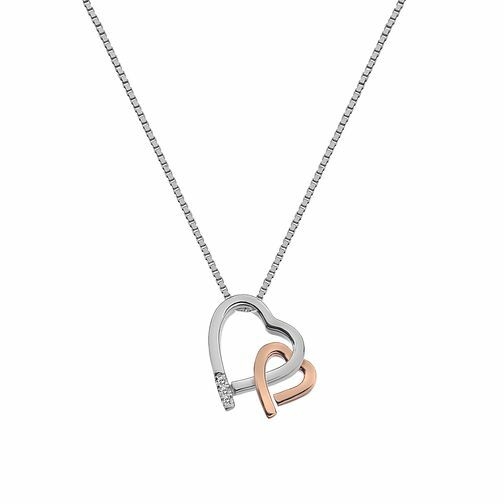 This elegant sterling silver and rose gold plated double heart pendant is set with delicate diamonds. Hot Diamonds Silver & Rose Gold Double Heart Pendant is rated 3.7 out of 5 by 3. Rated 1 out of 5 by Anonymous from Small I recently purchased this online for my Mum and was so disappointed when it arrived. It was so much smaller than I expected , no idea how many diamonds were on it as i couldn’t see as they were so small - magnifying glass needed to be able to see them. Unfortunately I had to return it as I didn’t think it was worth the money.